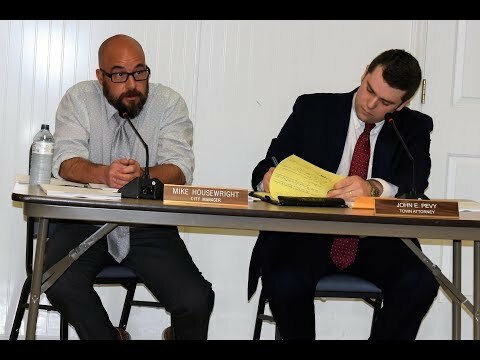 MOUNT CARMEL — An alderman’s resignation; an attempted firing of the city manager; multiple audience ejections; audience members storming out in a rage; allegations of corruption and dishonesty; and a proposed budget $800,000 in the red. Welcome to the Mount Carmel Board of Mayor and Aldermen, the 2018 edition. The following is a brief summary of the events that transpired at Tuesday’s BMA meeting. A more in-depth report will appear in Thursday’s edition of the Times News. Planning Commission Chairman Garrett White was appointed to fill the seat of Alderman Diane Adams. Adams’ resignation letter dated March 27 states multiple reasons including: she was excluded from BMA conversations about policy changes; recent outcry from citizens made her feel threatened; she has been lied to and her trust betrayed. Former alderman candidate Denise Livesay and her supporters stated that she, as the next highest vote-getter in the most recent election, should be appointed to the seat. Livesay and some of her companions were eventually ejected from the meeting for arguing with board members after the public comments time had ended. Mayor Chris Jones made a motion to fire recently hired City Manager Mike Housewright, which failed by a vote of 2-2 with one abstention. When the motion was made, several people stormed out of the meeting screaming allegations of corruption and making ill comments toward Jones. The mayor pointed to the recently presented 2018-19 budget draft that is $800,000 in the red as a reason for Housewright’s termination, although City Recorder Marian Sandidge defended Housewright, stating that she drafted the budget. Alderman Jennifer Williams said it is unfair to blame Housewright, who was hired in December, for the overspending approved by the BMA. Jones and Alderman Margaret Christian voted to fire, Williams and Vice Mayor Carl Wolfe voted no, and White abstained. Housewright said the attempts to fire him can be traced directly to his demotion of former interim police chief George Copas back to patrolman. He said Copas was demoted for allegedly abusing the sick time policy and vacation buyback policy, although Jones noted that Copas is only following what the city policy allows.